Good grief, is it really Friday already? I honestly forgot until I logged onto Facebook today and saw that my fellow Doristas were starting to post this week’s French Fridays with Dorie recipe, Herbed Olives, and thought, crap!, better get posting. My excuse is that I am still focused on Thanksgiving. Since it is not a holiday here, we usually celebrate on Saturday by hosting the feast for friends. This means that I took off work today to start cleaning and prepping. It’s been a busy day but I now have cranberry sauce in the fridge, the pumpkin pie is made, and my turkey is happily brining. Can’t wait for tomorrow! 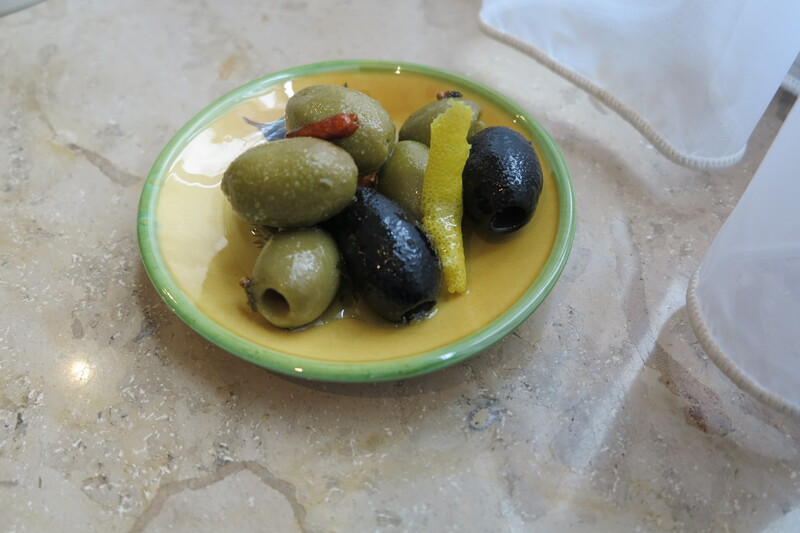 But until then, let’s talk about these olives. 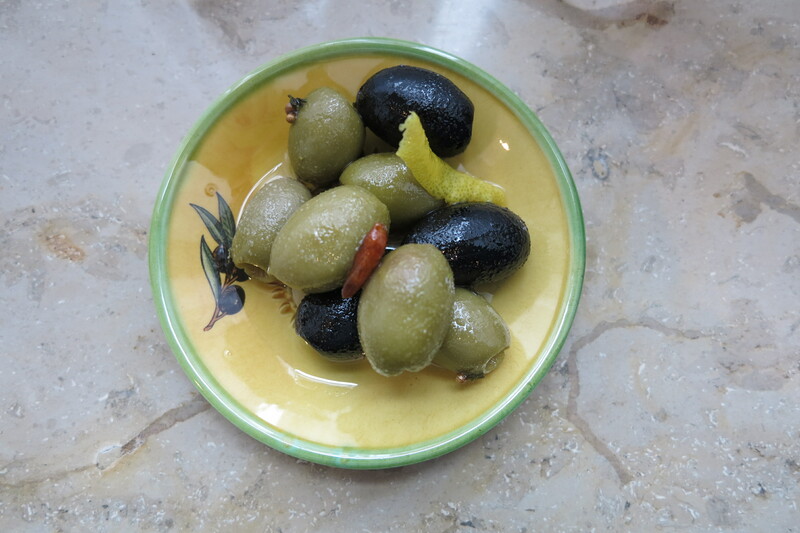 Dorie recommends that instead of buying pre-seasoned olives, buy plain ones and season them yourself. I’ll be honest, my first thought was, why? Seriously, varieties of seasoned and stuffed olives are available at every weekly market and self-respecting grocery store here in Frankfurt, so why would I make the effort to season them myself? But being the good little Dorista that I am, I went out and picked up plain olives. Everything else I already had in my fridge. So I mixed everything together and threw it into a jar. The next day I tried one and was not overly impressed. And then I left on a business trip. One week later I returned home, opened the fridge, and there were my olives, still marinating away. I opened up the jar and tried one, and oh my! They were really good. Really good! Suddenly I knew why one would bother to make their own seasoned olives. They are delicious and take almost no effort. I will be making these again. This entry was posted in french fridays with dorie and tagged Around my French Table, finger food, vegetarian. Bookmark the permalink. I tried some after one day of marinating and they were good, but not totally there yet. I saved the rest for later this week & am looking forward to trying them! Best wishes on your dinner tomorrow. I still say ‘why’ only because, well, why really? 🙂 I’m glad I know I can do it if for some reason I ever find myself in some back woods town where they don’t have an olive merchant but until then, I enjoy picking them out too much. The only plus side I can think of is all that extra oil has been making great fodder for bread dipping snacks all week long. the recipe and the longer it hangs around, the better. Even the oil does not go to waste. Enjoy your Thanksgiving dinner, I am all ” turkeyed” out. Ours are good now, after a day’s marinating, but I’m looking forward to trying the rest later in the week. Hope your dinner tomorrow is fantastic! Yes, these are better when the flavors get absorbed. I hope your Thanksgiving feast tomorrow is wonderful, Rose! These would make a good appetizer. We took a 2-day approach this year, the actual day celebrating at friends’ houses and then a repeat at home tonight with our own turkey so we can enjoy leftovers! Your olives look great and you’ve got me excited about making this recipe for next week! Friday snuck up on me so fast that I didn’t even realize it had passed already! Kudos for getting this done in time. Many days marinating will deliver great olives and a great infused olive oil. Perfect for any celebration! And such an easy recipe. Have fun tonight! Rose, hope that you had a wonderful party with that lovely sounding food that you prepared! 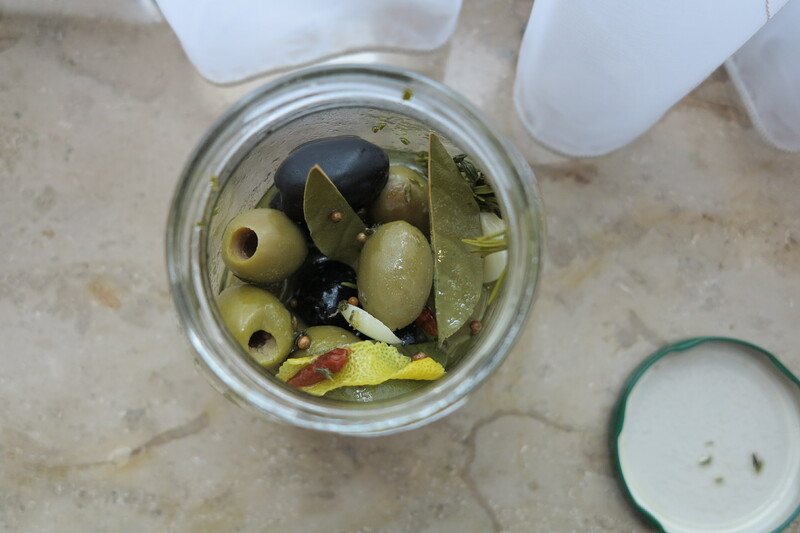 Your marinated mediterranean olives look terrific too and letting them “macerate” for a good few days probably made them even all the better! Your party sounds like so much fun. I “had” to make Thanksgiving dinner for friends when I lived in Australia too. Fun sharing traditions! I loved these too, and will make them again. I actually made mine 2-3 weeks in advance. Like you, the first ones I tried when I originally made them were good, but not special – but after a little time – fantastic! For once, I actually read the recipe early and found out that they could be kept for 2 months! Your story is my story. I was glad we had a simple recipe for the Thanksgiving holidays and ask myself, “Why would I make my own when there are so many different varieties available to buy?” First, I loved the aroma of the herbs and spices roasting and cooking in the oil. You cannot get that at a grocery store. Then, the flavor after a week or so was fabulous. There is something about “making your own” that is very nice, don’t you think? Yours look very pretty in their tiny plate. I felt the same way as you did…all of a sudden it was friday! I didn’t get my post up until sunday! 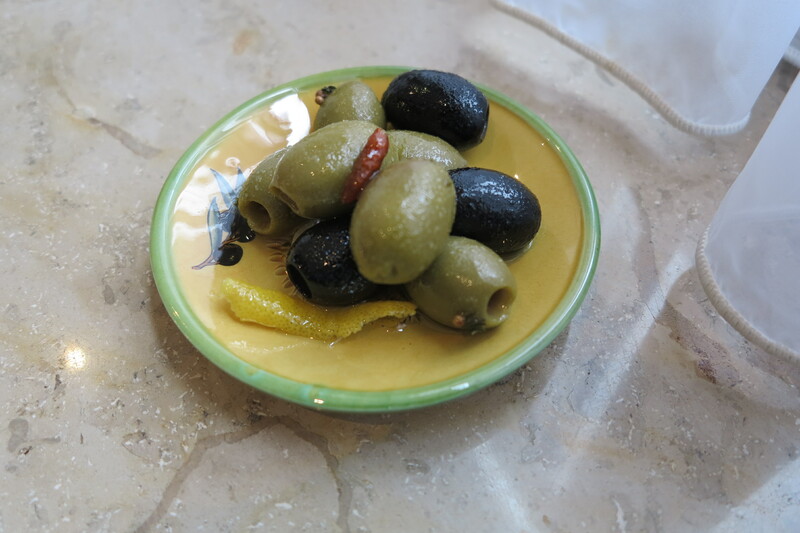 These olives were so good, and were full of flavor…a perfect addition to our Thanksgiving table! So glad you enjoyed them.